What's new in AcuSolve 2017 ? Watch the video to see what's new in the most recent release of AcuSolve. Video coming soon. The 2017 release of the AcuSolve product suite brings major advancements in CFD modeling capabilities to HyperWorks users. 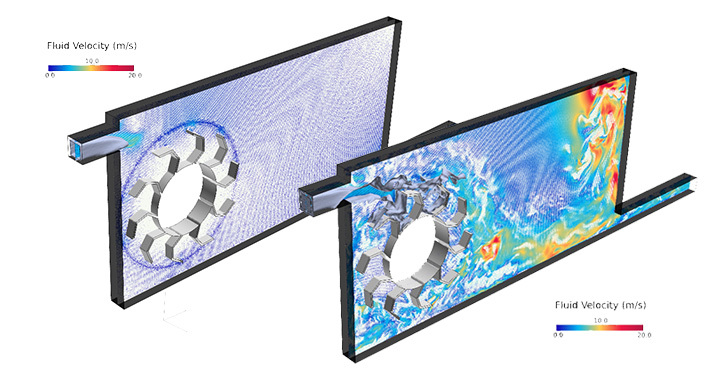 The latest release of the software contains an expanded suite of physics, enabling the simulation of transitional turbulent flows, immiscible multiphase flows, and advanced moving mesh capabilities. 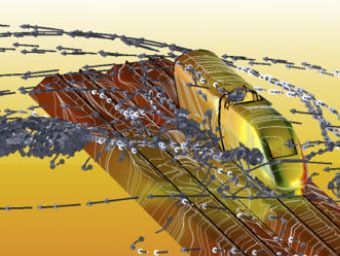 In addition to the new physics that are supported with the 2017 release, the software also contains enhancements to existing features, such as an expanded selection of RANS turbulence models, enhancements to the accuracy of non-conformal mesh interfaces, and usability improvements for automatic splitting of nodes. AcuSolve 2017 delivers major improvements in turbulence modeling capability. This release expands the range of applications that can be simulated with AcuSolve by introducing new physical models, improving on existing models, and providing more user control over the equations that are solved. The following features are the highlights of the turbulence modeling improvements in AcuSolve 2017. Turbulent transition plays a major role in the simulation of many engineering applications in which the boundary layer physics dominate the performance of the device. Examples of these types of applications include flow over airfoils, wings turbine blades and many passenger vehicles. Traditional RANS turbulence models are not capable of accurately predicting the natural transition process that occurs as the laminar boundary layer develops instabilities and becomes turbulent. In order to properly account for the physics of this process, additional models are necessary. AcuSolve 2017 contains two new turbulent transition models targeted at addressing performance of fully turbulent RANS models. Both models rely on a local value of intermittency to determine if the flow is laminar or turbulent, and use this value to control the generation of the turbulent transport variable. The most general model is known as the “Gamma-Re_theta” model and represents the earliest published version of a local correlation based transition model. This model solves for an additional two equations, one representing the intermittency, and the other representing the transition onset criteria that is written in terms of the momentum thickness Reynolds number. 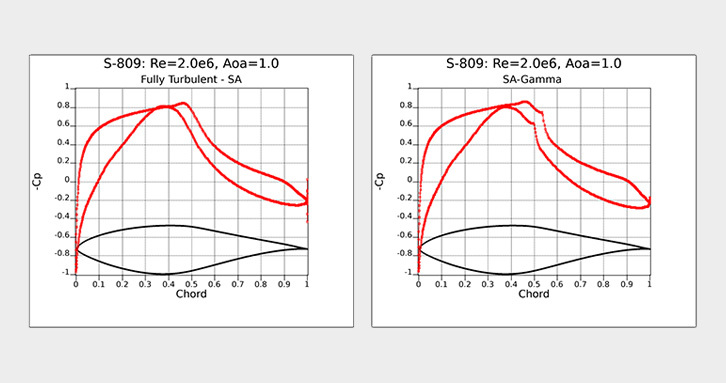 This transition model can be coupled with either the SST or Spalart-Allmaras RANS model. The second transition model that is available in AcuSolve 2017 is known as the “Gamma” model and represents a simplification of the Gamma-Re_theta closure. This model eliminates the second equation and solves only for the intermittency transport. This model may also be paired with either the SST or Spalart-Allmaras turbulence closure. 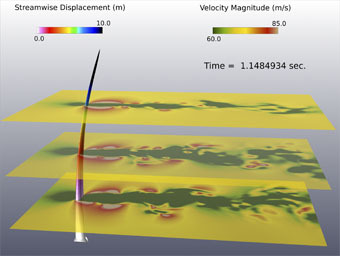 Simulation of University of Michigan Solar Car with fully turbulent (left) Gamma (center) and Gamma-Re-Theta (right). AcuSolve 2017 adds a total of three new k-epsilon based turbulence models to the suite of supported RANS closures. These models include the realizable k-epsilon model, the RNG k-epsilon model, and the standard k-epsilon model. All models are fully compatible with AcuSolve’s other features. The most significant of the changes associated with the k-epsilon turbulence models involves the addition of the dissipation_rate variable and the accompanying wall function. In contrast to the eddy_frequency variable, the dissipation_rate has very poor numerical behavior near the wall. To mitigate this challenge, AcuSolve utilizes a two-layer model on the dissipation rate equation. At low y+ values, the solver uses an algebraic expression to compute the dissipation rate. As the distance from the wall increases, the solver blends the value of the algebraic expression into the solution of the differential equation, then eventually transitions to using the differential equation solution fully beyond a specific y+. This two layer treatment produces a robust and stable solution from the k-epsilon models and is the default wall function for all three variants of k-epsilon. The two layer formulation is valid through the laminar sublayer, and has no lower limit on the y+ value. However, the upper limit on y+ for the two-layer formulation is on the order of 50. Users should design their meshes accordingly to avoid models with large y+ values. This will lead to a degradation in accuracy of the boundary layer profile. Validation case of turbulent flow through an internal duct, demonstrating Realizable K-Epsilon results. Validation case of external turbulent flow past a wall protrusion, demonstrating Realizable K-Epsilon results. AcuSolve 2017 represents the first release of the solver targeted towards the simulation of multiphase flows. AcuSolve’s initial offering within this field is targeted at applications that are typically simulated using a Volume of Fluid (VOF) approach. These applications include slug flows, free surface flows, and stratified flows. These applications are characterized by large regions of immiscible fluids in contact with each other. The interface between the fluids is tracked using an Eulerian interface tracking approach. This enables the simulation of pouring liquids, free surfaces with large amounts of deformation, bubble entrainment, tank filling/draining applications, tank sloshing applications, and many more. 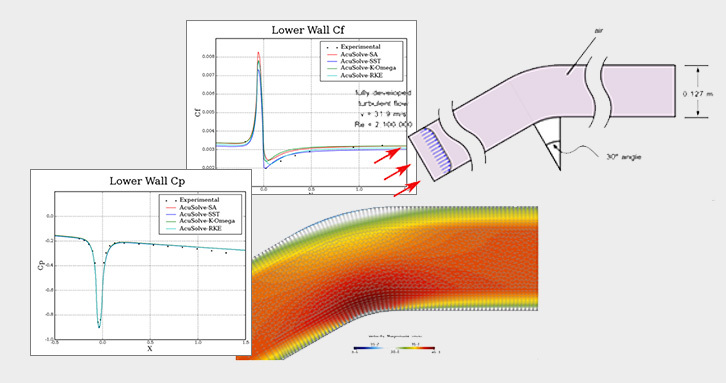 AcuSolve’s multiphase flow simulation capability enables the simulation of 2 immiscible, incompressible fluids. The initial offering of models supports the simulation of these fluids in combination with heat transfer, turbulence, moving and deforming meshes, non-conformal interfaces, and Fluid-Structure Interaction (rigid body dynamics and flexible bodies). There is no limit on the density ratio of the two fluids, enabling the simulation of air/water, oil/water, etc. AcuSolve’s multiphase implementation relies on the same solver as all other features, and retains many of the solver’s beneficial characteristics for transient flow simulations. Waterwheel simulation demonstrating how a high density fluid forces the impeller to rotate. AcuSolve’s non-conformal mesh interface technology has been improved for the 2017 release. This release includes changes to the formulation that improve the accuracy of the solution across the interface as well as a number of other enhancements and fixes. Starting with AcuSolve 2017, users have two options available for the calculation of the flow across non-conformal interfaces. Both approaches rely on a penalty method for ensuring continuity of the flow across discontinuous interfaces. The newly developed method has proven better at producing smooth solutions across non-conformal mesh interface and retains the robustness and speed of the legacy approach. When using the new interface formulation, the best results will be achieved when the mesh on all surfaces in contact with each other have the same element size. This means that the mesh on all touching interfaces should be of constant and uniform size in all directions. The best way to achieve this is to specify a constant surface mesh size on all interface surfaces, then grow a single layer of boundary layer elements off of the interface to ensure consistent height in the surface normal direction. The AcuSolve 2017 release includes an enhancement to the non-conformal mesh technology that enables interface surfaces to be embedded within mesh regions that are undergoing complex rigid body motions as well as local deformation. This enhancement expands the applications that can be solved using AcuSolve’s moving mesh and interface surface technology such that very complex motions can be simulated by combining these technologies. An example of where this enhancement is beneficial is when simulating the rigid body motion of a rotor craft with a rotating rotor and pitching blades. The blades of the rotor can be embedded into a local surface of revolution to handle the changing pitch of the blades, while the entire rotor is embedded in another rotating region that handles the rotation of the rotor about its main axis. The 2017 release marks the introduction of the “half-step” mesh displacement output in AcuSolve. 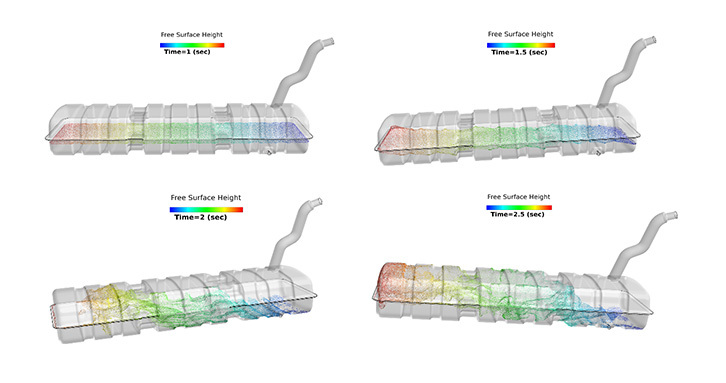 When performing moving mesh simulations, AcuSolve satisfies the equations at the half time steps. To properly visualize the continuous flow across non-conformal interfaces, it is necessary to visualize the results on the deformed mesh that corresponds to the half time step. Starting with the 2017 release, this can be accomplished by using the -defcrd command line option to AcuTrans. When this option is set to endstep, the deformed coordinates that are written to the output file correspond to the coordinates at the end of the step. When this option is set to midstep, the deformed coordinates correspond to the displacement at the middle of the time step. The AcuFieldView direct reader has also been modified to allow visualization of the results on the mid step displacement field. This is accomplished by setting the FV_ACUSOLVE_PREFER_MIDSTEP environment variable to any value. Note that the mesh displacement vector is still written to disk as mesh_displacement regardless of whether it corresponds to the mid step or end step. The 2017 release of AcuSolve delivers an expanded documentation offering to provide tools for successfully learning how to use the software, demonstrating the accuracy of the software, and providing an overview of CFD to new users. The AcuSolve tutorial manual has been expanded to include a total of 19 new tutorial cases. 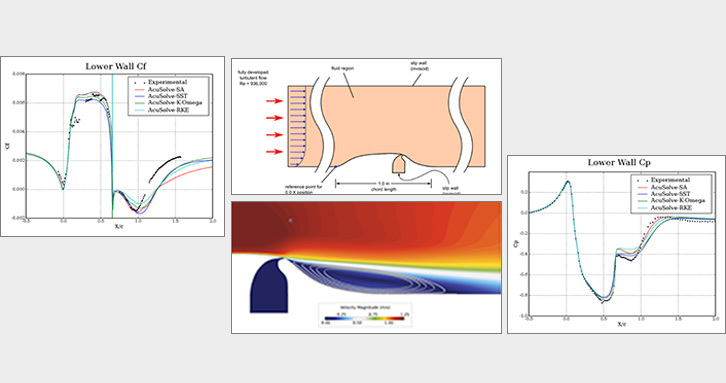 The newly introduced cases feature tutorials covering the new capabilities of the solver including turbulent transition modeling as well as multiphase flow simulation. In addition to covering the new features, a collection of tutorials has been added to demonstrate the capabilities of AcuSolve for simulating rotating machinery, free surfaces, heat transfer, and multiphysics applications. As with previous releases, the complete set of input files and documentation for setting up and running the models is included in the AcuSolve installation. The AcuSolve validation manual has been expanded to include examples that cover the newly introduced physical models. In addition to adding cases for turbulent transition and multiphase, additional turbulent simulations have been added to compare the performance of the expanded set of turbulence models. 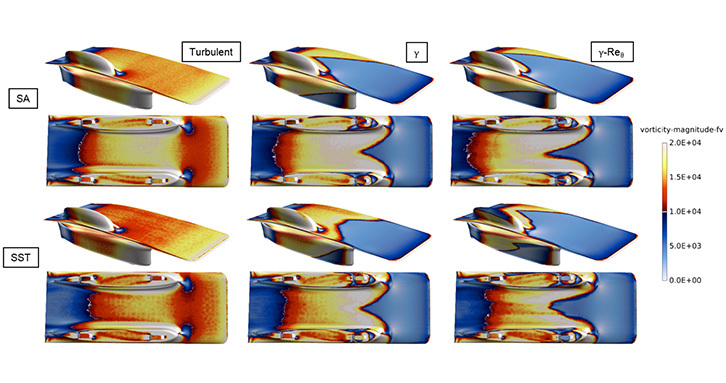 Comparison of coefficient of pressure for the S-809 airfoil at 1.0° angle of attack for Fully Turbulent – Spalart Allmaras model (left) and including transition effects with the Spalart Allmaras-Gamma model (right). AcuSolve 2017 marks the first release of the AcuSolve Training Manual. The training manual provides an overview of the theory and background necessary to learn the fundamental concepts associated with performing CFD analysis with AcuSolve. The training manual includes general theory sessions, as well as exercises that can be used to learn to use AcuSolve. This manual provides a good overview of CFD and AcuSolve that can be used as a self-paced training. These manuals are available via Altair|Connect under Downloads > HyperWorks. The AcuSolve Direct Reader and FV-UNS reader have been updated to give users additional control of how their data is read into AcuFieldView. The readers include the ability to modify the amount of Grid Processing done on the dataset when it is loaded. If users are interested in reading data as fast as possible and reducing memory footprint, selecting Less Grid Processing can reduce the data read time by up to 4x. Selecting More Grid Processing will increase the read time and memory footprint, but leads to increased performance during coordinate sweeps and streamline generation. Selecting Balanced will provide a compromise of both settings. Additionally, the grid processing functionality has been included within the data_input_table for interacting with the data via FVX scripts. 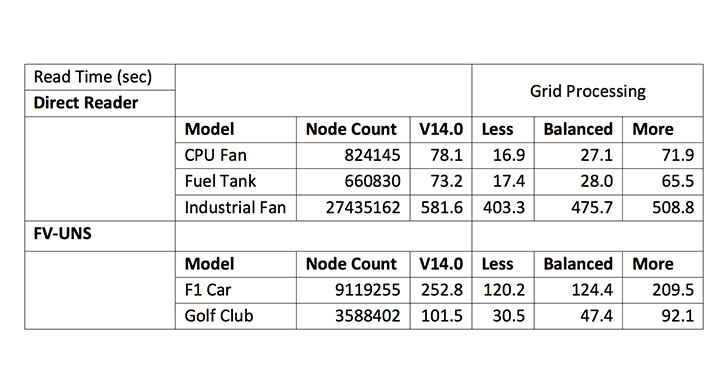 The following table summarizes the read performance for the three grid processing options. AcuFieldView is now able to export 3D PDF format files for interactively viewing simulation results directly with Adobe Acrobat Reader versions 10, 11 and DC on Windows systems, and with various reader applications on mobile devices. When users select the 3D PDF Export button, the current window will be exported to a 3D PDF format file. The GUI panel to manage the export process, shown below, is invoked from the Tools menu entry "3D PDF Write..." or alternatively from the 3D PDF icon on the Main Toolbar. The resulting PDF file contains 3D geometry which may be viewed and rendered with any of the provided controls in 3D PDF viewers. All surfaces, rakes and geometries for all datasets that appear in the current window are exported to the 3D PDF file with several small exceptions. AcuFieldView annotation titles, arrows and legends are exported as data to be rendered on top of 3D objects, for high quality readability. Dataset outlines and axes markers are not exported as the 3D PDF viewer will have its own version of these. Two new surface display type options, Vertices and Shaded Vertices, are available for Computational, Iso, Coordinate and Boundary Surfaces. The motivation behind the new types is to provide high performance renderings that bring additional insight for complex Iso-Surfaces and geometries. These new display types provide a great alternate to transparent shaded surfaces for revealing the complexity of internal geometries and convoluted Iso-sur¬faces. In addition, they carry information on the local level of mesh refinement. Added higher order surface representation to GUIDE_SURFACE command to enable smoothing of the discrete surface. Added a check at inlet boundary conditions to protect against zero values of eddy viscosity for Spalart-Allmaras based models. Added sustaining terms to SST and k-epsilon based turbulence models to prevent decay of turbulent energy in external flows. Reduced the frequency at which the interface search is performed for sliding mesh applications when the mesh stagger is solved multiple times consecutively. AcuSub now truncates problem names according to the maximum length that is supported by the scheduler. Automatic initialization is now performed for Spalart-Allmaras based turbulence models when zero initial conditions are detected. This change makes the behavior of Spalart-Allmaras consistent with the behavior of the 2-equation turbulence models under these circumstances. Improved the performance of AcuPev when operating on large models with a large number of eigen vectors. Added mixed topology surface and element set support to AcuTrace. Added a check in AcuPrep to capture inlet values of eddy viscosity that are set to 0.0 for turbulent simulations. Reduced the frequency at which the interface search is performed for sliding mesh applications that solve the mesh stagger multiple times per pass. Resolved a crash in AcuPrep with models that contained large numbers of simple boundary conditions and surface outputs. Resolved a problem in AcuSolve when trying to restart from a simulation that contained a moving mesh and a solid element set. Resolved a problem in AcuSolve when using ELEMENT_OUTPUT in a simulation that contained a moving mesh and a solid element set. Corrected a problem with the satisfy_boundary_condition option of the NODAL_INITIAL_CONDITION command such that it does not apply to all variables in the simulation. Instead, it is applied only to the variable referenced in the current NODAL_INITIAL_CONDITION command. Resolved a problem with compression heating that led to incorrect results. Fixed a bug associated with specifying anisotropic thermal conductivity through UDF. Fixed a segmentation fault in AcuPrep when a SIMPLE_BOUNDARY_CONDITION command was applied to an element set having medium=none. Fixed a number of issues associated with special characters in the PATH variable on Windows platforms. Resolved an issue with AcuProj when projecting results from a mesh that contained prism elements. Resolved a segmentation fault in AcuPrep when encountering improperly formatted input. Fixed a bug that impacted the behavior of ALE free surface mesh displacement when using periodic boundary conditions. Fixed a bug that caused spurious pressure and velocity fields on guide surfaces when using match_mesh_velocity. Fixed a bug in AcuTrans that led to invalid Ensight files. Fixed a bug in AcuSolve that prevented the user specified Jacobian from being included in the left hand side matrix when applying a surface heat flux element boundary condition through UDF. Fixed a bug in AcuSolve that caused incorrect results when specifying a nodal boundary condition for omega using a UDF.